Smart Service mechanical contractor software for QuickBooks eliminates screen hopping and double entered data. Smart Service is the best choice for your mechanical contractor business because we sync with QuickBooks. Any action you take in Smart Service is automatically documented in QuickBooks. No hassle. No fuss. No wasted time. You chose QuickBooks because it makes your billing, accounting, and maybe even payroll easier. It’s an efficient way to manage your business’ books. Smart Service does the same thing for your scheduling, dispatching, and form management. Better still, Smart Service talks to QuickBooks, meaning that rather than having two separate entities to manage, Smart Service updates QuickBooks with your daily actions and changes. Instead of running the risk of human error when copying information back and forth, you only have to enter it once. Smart Service QuickBooks integrated mechanical contractor software is the best way to manage your daily operations. Because Smart Service integrates with QuickBooks, you never have to worry about where your data lives. All of your customers, past jobs, billing cycles, and more become part of a Smart Service data file that you own. And when you need to schedule a new job, Smart Service has your customer library to pull records from. Not only does your office have this information, but your field technicians have access to it too! Any job history or customer information attached to a new job will show up on your technicians’ mobile devices with the Smart Service mobile app. Smart Service turns your mechanical contractor business into a seamless cycle of data that you control. Our mechanical contractor software for QuickBooks can optimize your relationship with preventative maintenance scheduling and paperwork. 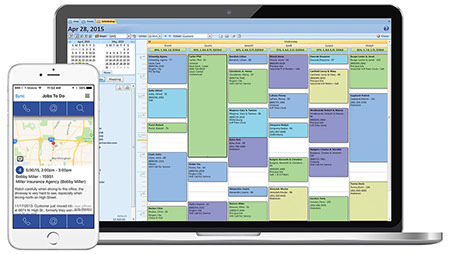 Smart Service allows for customizable scheduling and billing for each specific client. And the Smart Service mobile app lets your technicians take the forms with them on any mobile device to collect signatures throughout the day. As soon as a form is submitted, it’s sent back to the office and is now integrated with your QuickBooks. Reduce your clutter and maximize your efficiency with a software that links to QuickBooks. Smart Service gets rid of double entered data and the headaches that go along with it. Request a free demo of our mechanical contractor software for QuickBooks! Check out some of our articles and learn how to bring out the best in your business!